Dana White, spokeswoman for the Defence Department, said planning for the summer drills has stopped, but there have been no decisions made on any other military exercises with South Korea. The Pentagon on Monday, June 18, 2018, formally suspended a major military exercise planned for August with South Korea, a much-anticipated move stemming from President Donald Trump’s nuclear summit with North Korean leader Kim Jong Un. Washington: The Pentagon on Monday formally suspended a major military exercise planned for August with South Korea, a much-anticipated move stemming from President Donald Trump’s nuclear summit with North Korean leader Kim Jong Un. Dana White, spokeswoman for the Defence Department, said planning for the summer drills has stopped, but there have been no decisions made on any other military exercises with South Korea. Military exercises with other countries in the Pacific will continue. 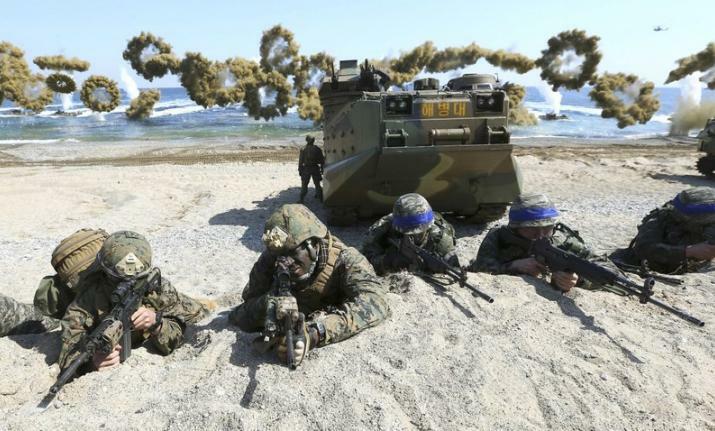 But as the days went by, the U.S. and Seoul began discussions about suspending the large Ulchi Freedom Guardian exercises that usually take place in August and possibly other joint drills while nuclear diplomacy with North Korea continues. Seoul’s Defence Ministry said Friday that Defence Minister Song Young-moo held “deep” discussions about the drills with U.S. Defence Secretary James Mattis in a telephone conversation Thursday evening. Defence officials are also scrambling to pull together cost estimates for the various exercises with the South to inform Trump’s assertion that the suspension will save an enormous amount of money. Mattis’s office sent out a request to military commands last Wednesday seeking information on costs, but the Pentagon has yet to provide a public answer.